Today I am grateful for Alarm Clocks. With out an alarm clock I know I would miss many different events and obligations that I have. I set alarms for different things and at different times of the day as reminders to take medication or wake up, take breaks and so on. I mainly use the alarm clock function on my smart phone for my alarms. I am also grateful today for cloth shopping bags. cloth shopping bags are a grate choice to carry and take with you when you do your shopping. Cloth shopping bags are much stronger than plastic bags and much better for the environment then their plastic counter parts. Many retailers now offer cloth shopping bags and some of them event reward you for bring your cloth shopping bags to the store. The third thing that I am grateful for today are lanyards. I have a lanyard that I use to hold my key chains. It is a bright red lanyard so I can easily spot my keys when I am looking for them when trying to head out. Lanyards are also used to hold ID badges or to identify people as event staff or volunteers. AM/FM RADIO & DUAL ALARM:setting two separate alarm waking to buzzer or radio. Digital tuning AM/FM radio with twenty channels preset memory, 10 AM stations and 10 FM stations.easily enter into your presetting radio frequency without manual search again. 180 DEGREE & FOCUS CONTROL:Project time onto the wall or ceiling with adjustable projection angle and focus control.180-degree swivel projection guarantee that you need not view time from clock display, Project ultra-clear time onto your walls or ceiling when you wake up to easily read time in your full view. 7 INCH & DIMMABLE LED DISPLAY:Annoying Bright Display can not fall asleep? 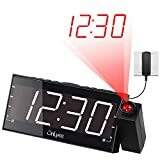 This alarm clock is designed perfectly with 3 dimming levels,just dimmer display and watch projection time on ceiling to fit for your personal preference at night. Not enough plug points? 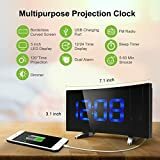 Charge your smartphone through this clock with built in USB charging port.USB charging compatible with all android & IOS smartphones, tablets, mobile phones . (an appropriate cable switch is required). AC POWER & BATTERY BACKUP:AC powered for functions of radio,alarm and time display.Two AAA 1.5V batteries(not included) are required to ensure memorization of Time setting that you don't need to re-set time when power outages.